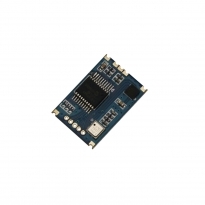 DSPC01 is a type of digital sensor module which consists of a high resolution piezo-resistive pressure sensor, a compass sensor and a MCU. By one module DSPC01 can measure pressure, temperature and compass parameters. The output data are digitally calibrated and users can easily access related data through I2C interface, which shortens the development time and simplifies the work of designers greatly. DSTH01 is a type of digital relative humidity and temperature sensor module which integrates temperature and humidity sensor elements, an analog-to-digital converter, signal processing, calibration data and an I2C host interface. Both the temperature and humidity sensors are factory-calibrated and the calibration data is stored in the on-chip non-volatile memory which ensures the DSTH01 modules are fully interchangeable and no recalibration or software changes are required.